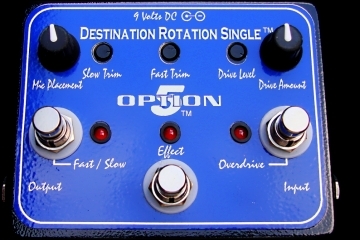 The Destination Rotation Single is 100% analog and low noise. The doppler effect is tight and the phasing characteristics are liquid sounding. The DR Single is 100% hand-built and thoroughly tested before it leaves my hands. It is built like a tank with high quality components, all lead (Pb) free soldered to a carefully designed and super-solid, double sided, plate-through PC board that is also Pb free. All that is housed in a die-cast aluminum box that will not rust or fall apart. 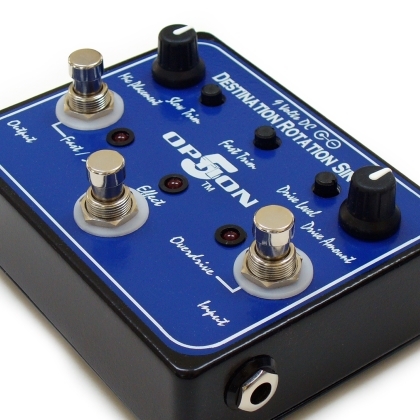 As with all Option 5 products, the DR Single is built to last! Top side trimmers for slow/fast speed tweaking. Mic placement control for effect depth.